Floodwaters from Hurricane Florence have breached a 1,100-acre cooling lake dam at the L.V. 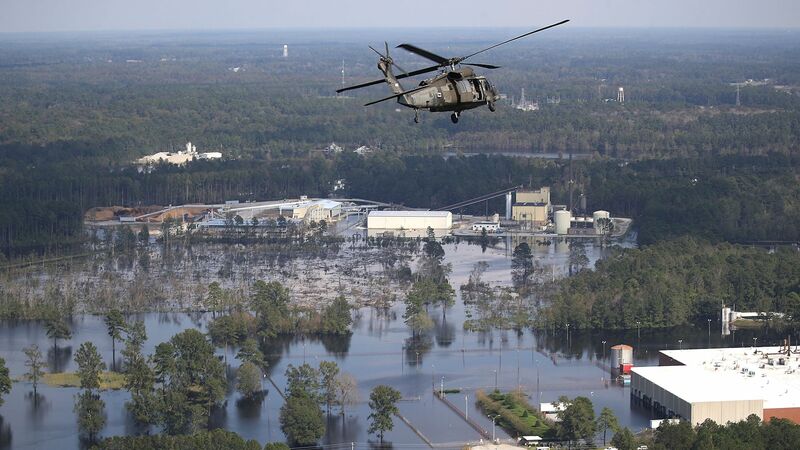 Sutton Power Station in North Carolina, about 8 miles northwest of Wilmington, Duke Energy told Axios. The power plant, which now runs on natural gas, has shut down in response to the flooding. Why it matters: Coal ash contains hazardous heavy metals that are harmful to human health, such as arsenic and mercury. If these pollutants enter water supplies, they pose a serious hazard to public health. The details: Duke Energy also had an incident at this plant earlier this week, when the company reported that Sutton Lake had not been compromised despite an adjacent coal ash landfill losing enough waste to fill about 200 dump trucks. However, the ongoing spill is a new, more significant breach associated with the same facility, and coal ash may now be flowing into the Cape Fear River from two areas. A recent Duke statement indicates that floodwaters caused several breaches in a dam on the south end of Sutton Lake, which is flowing directly into the Cape Fear River. The lake is also being overtopped from the north, and waters are flowing into other parts of the plant. A Duke Energy photo showing the Sutton cooling lake waters exiting a breach at the south end back to the Cape Fear River on September 21, 2018. Photo: Duke Energy. The company said cenospheres, which are light, hollow beads that are byproducts of coal combustion, are moving into the river. However, the company believes that more hazardous coal ash in two basins at the site have not been compromised. "Site personnel are supplementing on-site supplies with large stone and other materials, engineering experts are moving to the site and personnel continue to develop and activate repair plans." But Pete Harrison, a staff attorney for Earthjustice, told Axios that coal ash was visible on the river as of Friday afternoon. "You mostly see these swirling plumes of white coal ash, and that extends for miles downstream," he said by phone from a boat on the Cape Fear River, just downstream from the plant. "Very clearly, coal ash is entering the Cape Fear River now and has been all afternoon." The cenospheres that Duke Energy says are not hazardous can contain more dangerous coal ash materials attached to them, Harrison said, disputing Duke Energy's portrayal. "The most visible stuff is going to be the cenospheres," he said, "but it appears that there are suspended particles in the water that aren't afloat." The cause: The Cape Fear River is still rising and is expected to crest on Saturday after record rains inundated the state from the slow-moving hurricane. The state set a record for the most rain ever recorded during any tropical storm or hurricane, beating the previous record by nearly 1 foot. The river may not drop below levels that breached parts of the power station until Tuesday, Harrison said. Go deeper: Florence's floods claim more lives, as pollution concerns mount.